4x12 Empty Guitar Cabinet No Woofers / Speakers Live Sound Pro Audio New Model # SA 412 Empty, 5/8 plywood front panel, Black carpet with black metal corners, Recessed handles, Full Metal Grill, Terminal cup with two 1/4" jack inputs, Ported, 29" tall 29" wide 12.75" deep, This speaker cabinet is brand new, One year warranty. 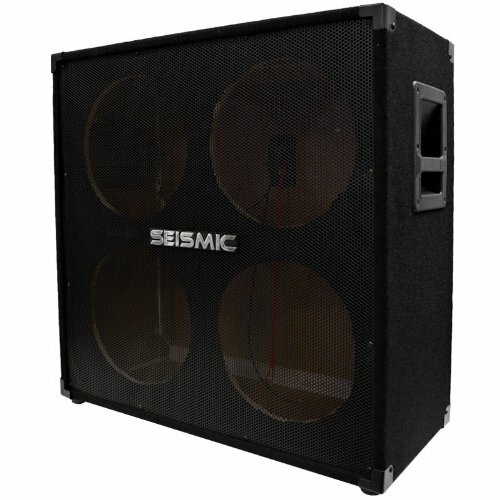 The Seismic Audio 4x12 empty guitar cabinets allow you to load them with any speakers you desire. The cabinet has an efficient enclosure, so that you are confident it will produce outstanding tonal variations. This 412 does not have the speakers. This listing is for a cabinet without the speakers. This cabinet contains everything pictured (corners, grill, ports, jack plate, plenty of wire, etc. ), but it does not have the woofers. Simply drop in the 12 "woofers of your choice and you are ready to rock. The Seismic Audio brand was designed to make the musician who is low on cash, still sound great. With your purchase, you will receive one EMPTY 4x12 Guitar Cabinet pictured and described above. Join the Seismic Audio Revolution and see what tens of thousands already know. Whether it is for the garage band, live sound, stage, or studio....Seismic Audio is bang for the buck, the best Pro Audio gear for all PA applications. View More In Unpowered Cabinets.